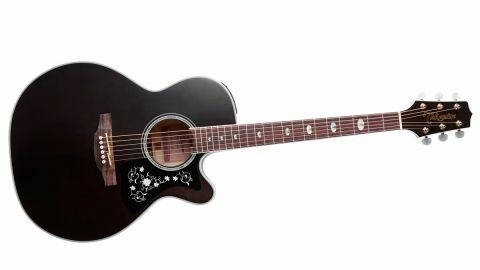 The GN75CE-TBK is something of a dark horse; a superb stage guitar if the looks appeal. An all-rounder with great playability. A lively performance unplugged and amplified. The look isn’t for everyone; we’re not keen on those inlays. The Takamine guitar that we have today falls into the affordable G-Series and this model and its price-point brings it into the most exciting end of the acoustic market. While others are getting subtle with satin, this is a glossy dreadnought wearing some confident honky tonk bling. We’re eager to find out if there’s depth underneath the showy surface. The gloss-finished GN75CE-TBK features quilted laminated maple back and sides that take on a smoky effect in their black and charcoal hues. Our eyes are also drawn to the country and western style ‘Grass Flower’ design on the black scratchplate, a contrast that echoes the white plastic binding on an acoustic aiming to unleash your Johnny Cash ambitions. We’re not convinced by the bold inlays, though. Takamine’s NEX shape is a scaled-down jumbo by its own description, slightly shallower than a dreadnought with a narrower waist. These add comfort when sitting that could be especially beneficial if you’re a beginner or getting back into playing. But its potential certainly goes beyond that. The TK-40D performs very well. It accurately captures a tonal character that’s got a little hollow roundness to the highs and mids for mellow lead work, with a very balanced low-end. But the medium-low action further enhances a liveliness in the projection that really encourages and rewards muscular strumming. Plugged in, the positive experience continues. are standard fare, but the Mid Contour, EQ Bypass and Notch Filter are not. It’s got the basics right, too - you can push the treble right up without things getting harsh - and the combinations of control at your disposal can enable you to do more on stage from the guitar.